My major gripe is when people without children park in the 'parent and child' parking spaces at the supermarket. How selfish is that? The elderly and the disabled think it's absolutely THEIR RIGHT to park in these spaces, but god forbid if I park in a disabled spot which quite rightly something I would not do. We all have to wait for a space. People should try carrying a baby in a car seat following a cesarian section (major surgery!). Not only that but stretching over in the car and fitting the car seat properly, or getting the baby out is very difficult following child birth. This is very difficult in a normal parking spot, it is much easier in the wider parking spots. These spots are also closer to the trolley collection points. Trust me, you do not want to leave a baby for a second alone in the car whilst you return your trolley. It's not just the people without children I find irritating. The thing that really annoys me the most are those people who sit and wait in their car (in a parent and child parking spot) with their brood of ten and think it is perfectly okay for the wife to nip out and get the shopping; meanwhile the husband and kids stay in the car and basically waste that space! It's ok we've got kids they're probably thinking! Well actually IT IS NOT, because you could just as easily park elsewhere and WAIT. Nonsense!! Me and my wife cannot have children through no fault of our own so these farcical parking spaces are a discrimination against us! Go forbid you have to walk a distance with your child or manoeuvre to get your precious child out of a car. This was never a problem in the past so why all of a sudden!? They should be abolished. Why make it easier for the breaders filling this country up with toxic children. Very annoyed Mother, are you under the impression that I'm Nikki? Well, that's a laugh! If you look back over a few gripes you'll see that we are 2 very different people. Unfortunately Nikki has not returned to the site since it's re-vamp. Stalag is someone else too. It sounds to me as if you are teaching your children that they are more important than anyone else, so they will grow up self-centred. This is not good. They have to learn to behave in public and be considerate to others, or they will not have people be considerate to them in return. I brought up 2 boys who were always well behaved in public and were taught not to be selfish. I'm not actually against parent & child parking spaces, although I don't remember there being any when the boys were little. I am against people who waste their years at school and don't properly learn to use their own language, as in you getting posters names wrong and then referring to a "pedal stool". By the way, I binged "travel system". It turns out to be a fancy new name for a convertible puschair/pram/carrycot. I had one when the boys were babies. Very useful it was. Where did anyone say you are a single mother? Not recently it seems. Free your mind 10, that's if it is you and not Nikki again. It might be worth you looking at previous posts that Nikki has posted to see how she has insulted not just me, but others before. You will then see how rude and disrespectful she actually is. Yes, you are correct there is no law stating that these spaces should be used by parents and children, however I think there should be, to stop abuse of them - purely my opinion. I don't know why you felt the need to put "we do too much for single parents as it is" as I feel that this is directed at me. I have read a lot of stereotypes on this site and just because I'm a parent you assume I'm single ? Previously, it was assumed that I did not pay taxes, which I do. Anything else anybody wants to assume and presume about me ? you're all parents and adults clearly. start acting like it , swearing and insulting each other on a webpage is very embarrassing. And the older generation believe younger people are rude and disrespectful , I think that's pretty funny considering most posts on here are off middle aged women arguing over a parking space. I agree these parking spaces should be used for parents and small children , if they were used correctly then maybe the 'dings' in your door side wouldn't have happened , as this is predominantly caused by young children as the weight of the door is too much for them to handle. However there is no law outlining the conditions to use these spaces. where as disabled spaces are protected by law and can result in the person being fined. so actually there is nothing similar in comparison between these two types of parking spaces as it kind of cancels all facts out when one has its rules protected by law / authority and the other is completely looked over probably... " because we do too much for single parents as it is " -one comment read. we also do too much for other countries who wouldn't put their hands in mug yet alone their pockets for us - but that's another debate for another time. Lol, Nikki why do you keep changing your name to post ? When did I say I was the centre of the universe ? The truth is, it is you that thinks that. Don't worry about my children I will teach them about inconsiderate people such as yourself and they will know there are people who will show them love and others that will not. Don't worry about my typing and spelling, I think you should be worried about not knowing what a travel system is. I do not think a tantrum is embarrassing, it is part of bringing children up and yes they do have them in public. Most parents understand this but you have the inability to do so - this is why I asked before if you are a mother as all I am seeing is ugly troll nonsense. By the way you haven't got to explain the phrase, water off a ducks back as I do know what that means. Don't presume I read hello magazine as you know nothing about me and would be very incorrect to assume so. Oh dear, Very annoyed mother. Where to start? Firstly I'll say I feel sorry for your children, really I do. They are going to find life very hard when reality slaps them in the face. When you address "Nicky" and "Moaning old git" I assume you mean Nikki and miserablemoaningit. Your inability to type names which are right in front of your eyes is worrying. You put your kids on a "pedal stool". Dear God, where did you get that from? But then I suppose the word "pedestal" doesn't come up very often in OK or Hello. Children need to be brought up with books. You say your children "decide" to have tantrums. This implies that they are also capable of deciding not to. In that case they really should learn that having a tantrum in public is embarrassing for all concerned. Yes, anyone who has a problem with it can leave the store, but I wonder how the manager of the store would feel if all their customers left the store en masse (that means all at the same time)? You accuse Nikki and mmg of being inconsiderate; don't you think allowing your children to have tantrums in a public place may be inconsiderate? God help anyone who finds themselves on a plane with your family! By the way, I haven't a clue what your phrase "you have never managed with a travel system" actually means. Perhaps you would enlighten us? if anyone has a problem they can leave the store." Came across this post after some years and thought I would post back to Nicky and Moaning old git. From reading all your comments I can see that both of you are ugly internet trolls and I think you should live next to each other, maybe on an island just for inconsiderate d#&k H#@#s just like you. Again, my point is that you have never managed with a travel system as you do not know what one is. Where did I mention that I wanted huge and special privileges ? 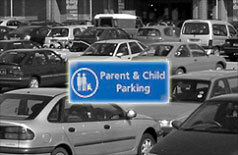 There are car park spaces offered for PARENT AND CHILD so there is not a struggle to do shopping and to keep children safe. They do not say Nicky can park here or inconsiderate a#s h#!@s. None of my comments are patronising they are fact and I do not need a round of applause for giving birth. I do put my kids on a pedal stool and I think that Nicky and Moaning old git were never cuddled as children so I'm sending big cuddles and peace your way. Get over the fact that there are parent and child spaces, put your efforts into something more positive and constructive eg stopping world hunger. I would just like to mention again that I do pay taxes and that if I do take my children shopping and they decide to have a tantrum then so be it, if anyone has a problem they can leave the store. A child would not be a child if they never had a tantrum. By the way, I would never have a drink with you Nicky as you are inconsiderate to the core. "how did people manage before parent and child spaces??" Well how did disabled people manage before they were given blue badges and mobility cars?? They're there for a reason, to allow parents with prams and small babies/children...and that's who they're for. It's no wonder we have so many fat children in the country. Can they not walk a few more metres. The parent and child bays should not be so close to the supermarket door. I see the same on the tube, children sitting down and elderly people having to stand. I make my daughter give up her seat for any adult. Everybody got on quite well before the supermarkets had parent child parking spaces but through my experience of having children you do have to open your car door wider to remove your loved ones from the car. This tends to cause damage to other peoples cars and even your own. In a worst case scenario I have witnessed people pulling in and out of spaces when children are being taken out and put into cars. Supermarkets came up with an idea of child and parent spaces to make it safer for our little people so they dont get squashed and our cars dont get damaged by doors being opened wider to fascilitate the removal of child car seats. Surely anybody with a disability would not want another person to be inflicted especially a child. I think that the fundamental problem is people not thinking about anybody else but themselves. Just have a little consideration for others its not that difficult and it also creates happiness something the world seems to lack. Thank you miserablemoaning git, we would probably get on like a house on fire!! Oops!! I have just noticed in my last posting that I put bar-burning instead of bra burning!! Very definitely a freudian slip, based on my love of pubs!! Splott: If you think that I would actually DISLIKE some nice gentleman opening the door for me, then clearly you have absolutely no idea what makes me tick whatsoever. I'm an old-fashioned girl, I LIKE good manners ... a gentleman holding the door for me is good manners. I was brought up to believe that the world does not owe you a living, you get off your backside and you make of life what you will with the cards you have been dealt. I am no bar-burning feminist, but neither can I abide male chauvinists. Can you explain to me why ... when I was 33 years old ... young, fit and healthy, although suffering from a bad back and a few pounds overweight ... I should have the right to my own extra-wide parking space in order for me to extract myself, my baby and a push car from my car when, at the grand old age of 59, suffering from an even badder back, severe chrondomalacea in my knees, and severe arthritis, but not overweight, I am not afforded such a luxury? It is this that frustrates me so ... do you get it now? the other day I paid for my parking ticket £1.50. I put the £1 and 50p into the slot. The machine then told me I had paid the incorrect amount and proceeded to return £40 in cash to me. Should I have pressed the buzzer and given it back to the carpark attentdant or not. Late motherhood, but at what cost?